Hey Gang! So have you been basking in the glow of a more organized kitchen? So far this month, we’ve decluttered our kitchen countertops, and organized all of our food storage areas. 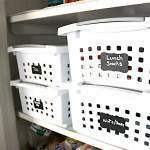 That brings us to kitchen cabinet organization week. 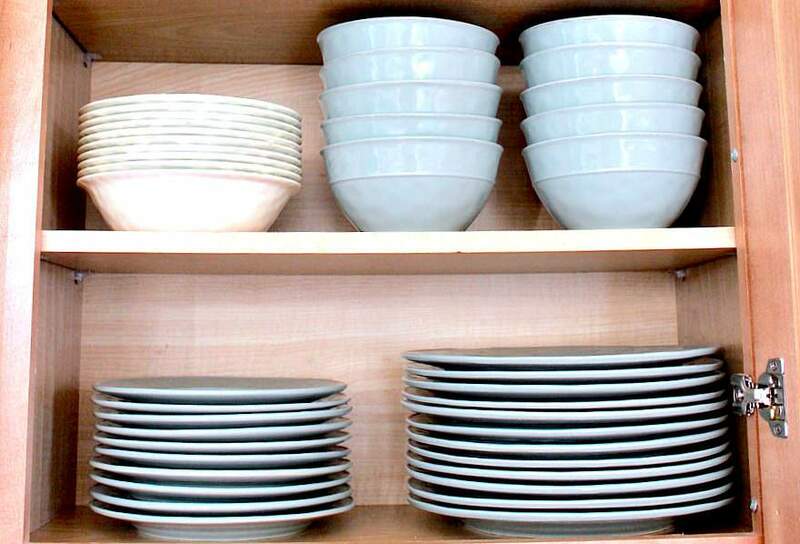 The #1 cardinal rule when it comes to decluttering and organizing your kitchen cabinets is to focus on only one cabinet at a time. Even if you’re feeling super ambitious, please resist the urge to tackle all of your cabinets simultaneously. I find that it’s a recipe for disaster and can quickly become overwhelming. Trust me, you’ll be shocked at how much stuff you’ll pull out of just one set of cabinets. With that being said, go ahead and grab your decluttering kit. Once you’ve set up your kitchen “zones” ahead of time, you’ll know what items to sort into the Relocate pile during the Sort/Purge step. 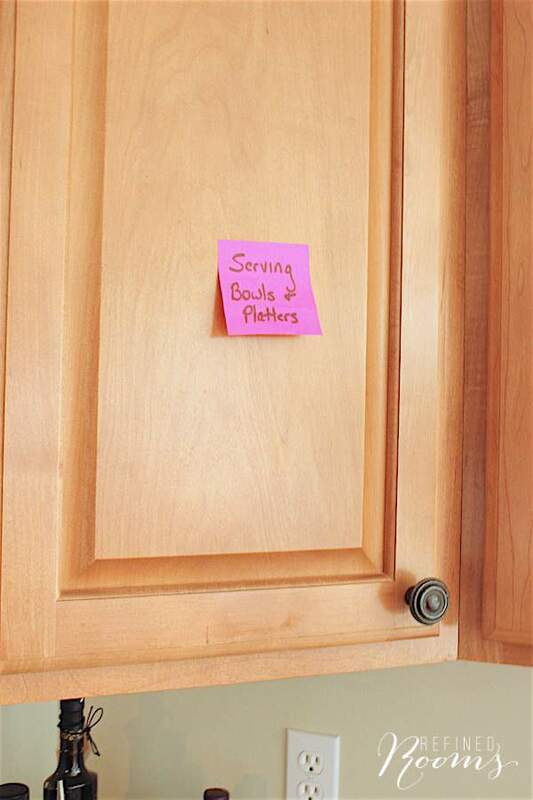 If you’re going to be doing some significant rearranging of the contents of your cabinets, use Post-It notes to temporarily label each of the new zones so that you don’t forget what you decided later on in the process. Remember that we’re killing two birds with one stone in the process (spring cleaning the kitchen + organizing it’s contents). So now’s the time to empty out those cabinets and give them a thorough wipe down. Take out every single thing? you ask. Yes. Every. Single. Thing. 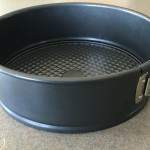 If space is limited in your kitchen, strongly consider relocating those seldom-used seasonal items that you’ve decided are worthy of keeping to another area of your home. Be sure to maximize your cabinet storage space by using solutions that take advantage of vertical space and help you to access items stored in those deep cabinets. Use baskets to keep items within the same categories together (and separate from other categories). Corralling small items together in baskets also prevents these items from being lost in the back of the cabinet. One last piece of advice. 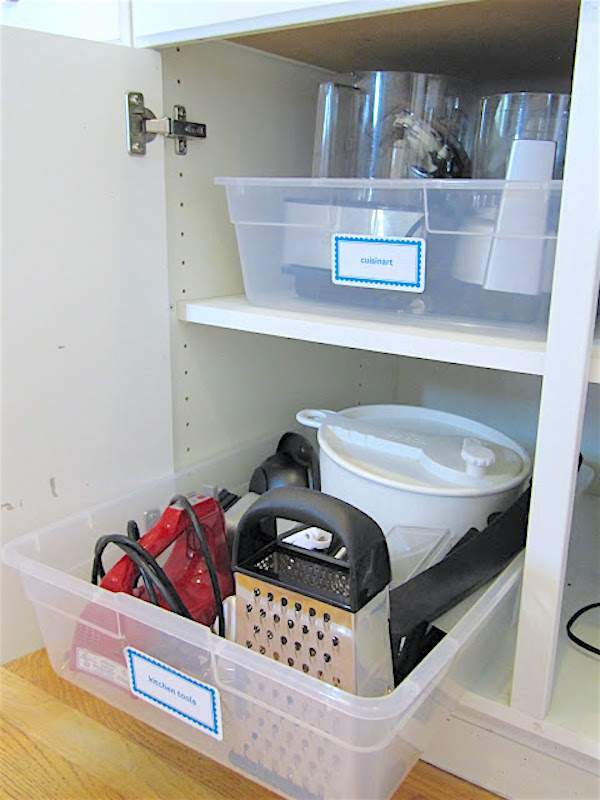 If you don’t already have the luxury of glide-out shelving built into your lower cabinets, consider installing one of the DIY glide-out shelf options. 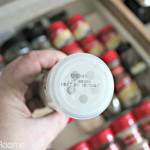 This small investment will pay you back a million times over, consider what a world of difference it makes in increasing accessibility of those items stored in the back of your lower cabinets. You know I must be obsessed with a product if it made the cut for my Top 10 List of Organizing Products. 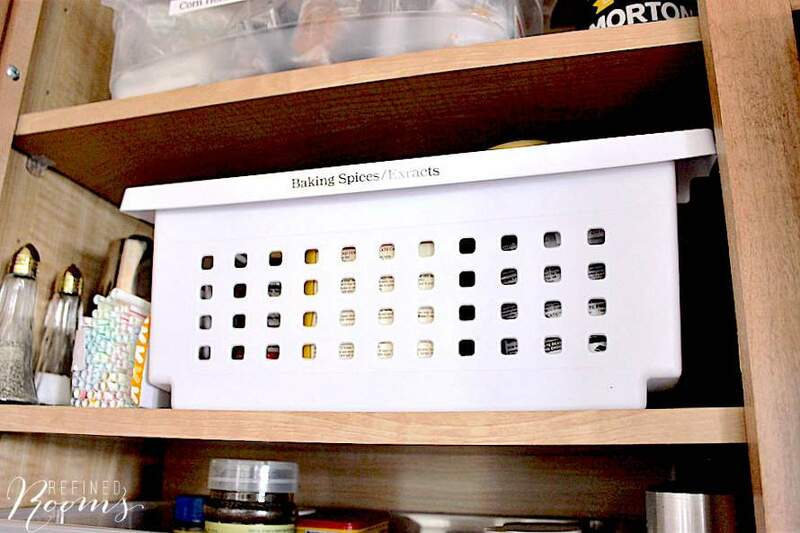 If this project is just not in the budget, check out this inexpensive organizing hack for transforming your lower cabinets into drawers. Genius! 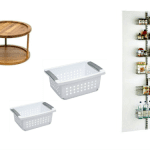 I’ve curated a whole heap of genius kitchen cabinet organization hacks over on my Pinterest Kitchen Organization board as well. When you have a moment, head over and be inspired! Plan to go through this process on an annual basis to keep your cabinets in ship shape. 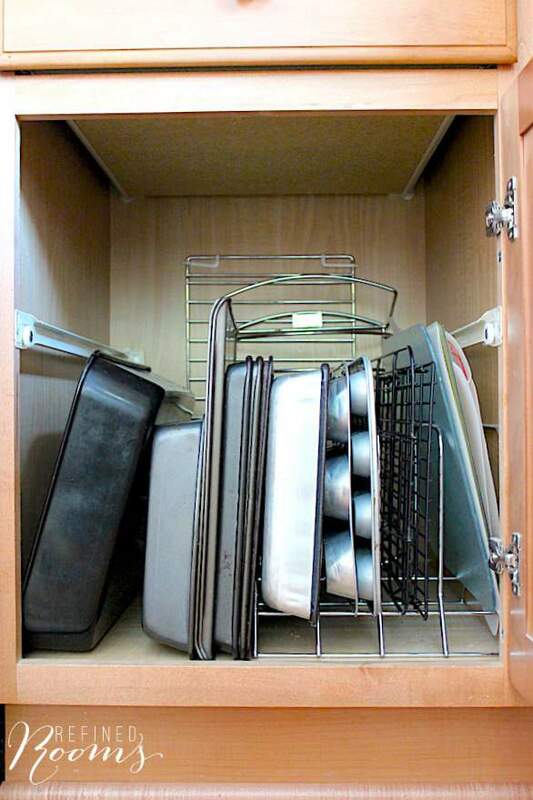 It’s helpful to schedule your kitchen cabinet organization maintenance in conjunction with your spring or fall cleaning. 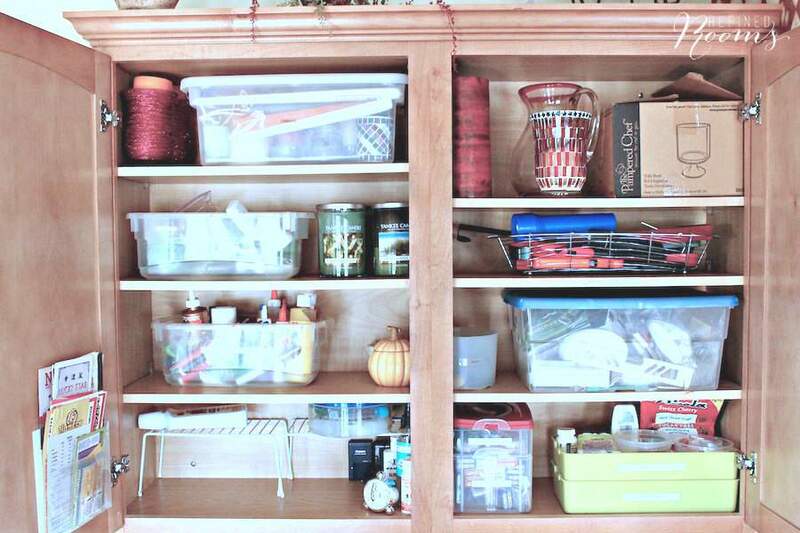 After you’ve completed this week’s assignment, share a photo of the items in your toss pile OR a photo of one of your newly organized cabinets on Instagram (use the hashtag #OrganizeandRefineChallenge and don’t forget to tag me) and/or share it in the Refined Rooms Facebook community. These are great tips. I always have an issue with organizing my cabinets. Thanks for sharing! Thanks for stopping by Sarena! Wow. I found an answer to a problem I have with a cabinet! Thanks! That’s so awesome Sarah! What was the problem? I am never quite satisfied which means I am a serial organizer. Loved your post. I found you on Nifty and you were not the post next to mine but I’m so glad I stopped by. Ha, a serial organizer…kindred spirits Clearissa! I’m so glad you stopped by too!